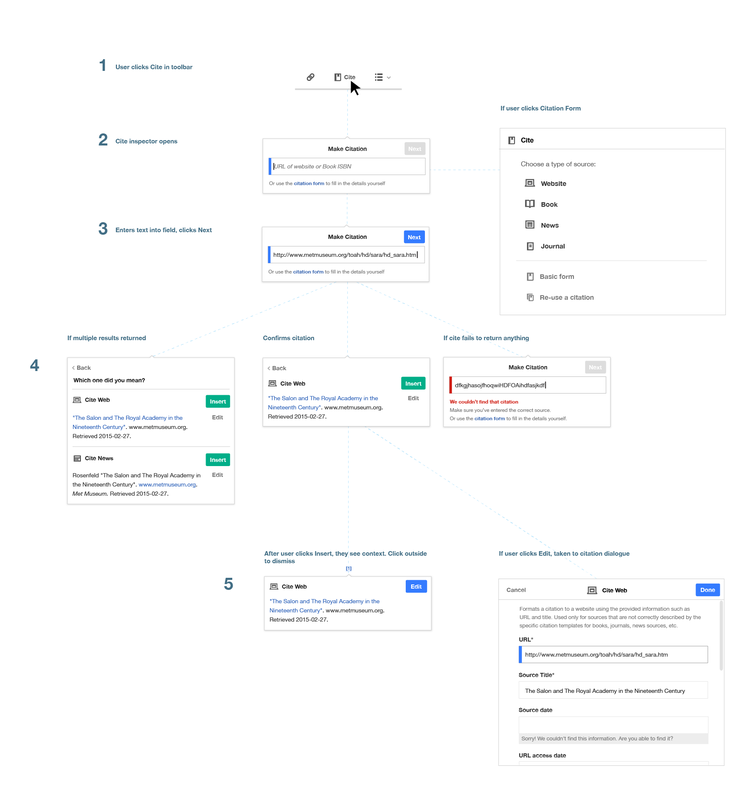 ⚓ T62768 Cite: Auto-filled references based on destination URL / DOI etc. 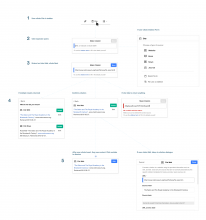 Cite: Auto-filled references based on destination URL / DOI etc. 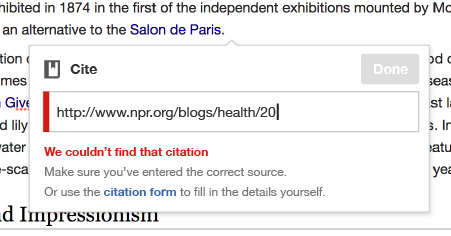 As an editor I can get paste a link or DOI into a simple form to get an auto-filled citation. 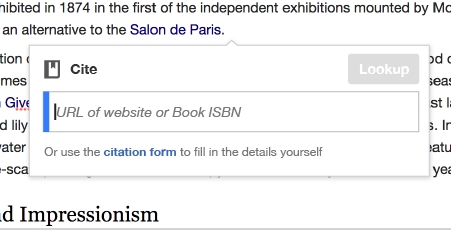 A user has their cursor in a place they would like to add a citation. They click the Cite button on the toolbar. An inspector opens in context, showing the title "Cite" a URL field, and a "Lookup" button. 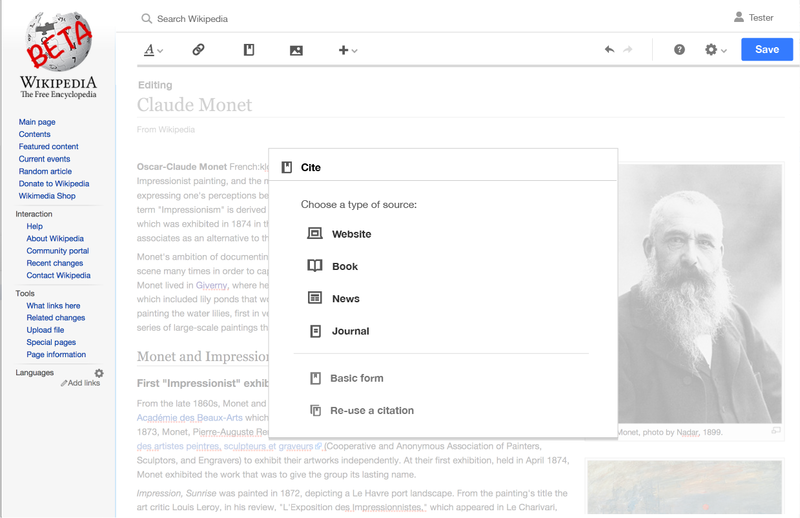 Include line below field with link that opens the manual citation dialogue. Resolved Mvolz T62768 Cite: Auto-filled references based on destination URL / DOI etc. What should the user see if there are no results? Also it's possible that if the scraping is bad- i.e. it's just the text of the url as the title- these automatically are set as web citations, but it's possible the user will want to change the citation type from web to journal, for instance. Any thoughts on that? I think we should leave the user on the same screen, in case they messed up the number and want to try again. 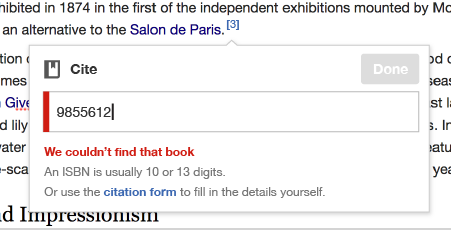 We should show an error message that says something like "We couldn't find that book" and maybe give a hint like "An ISBN is usually 10 or 13 digits." And the user still has the option at the bottom to go to the screen to enter the citation manually. Jdforrester-WMF added subscribers: Aklapper, The_RedBurn. Jdforrester-WMF moved this task from Unscheduled to March 2015: Features & Apps on the Roadmap board. Can we project a "week of" deployment ETA? No. Everything is backed up on T89656: Get citoid working in production which has an unknown schedule. FYI citoid does not support ISBNs yet so I edited that bit out- very surprised to find out we supported ISBNs when I read the tech bulletin on my RSS reader this morning, and it was probably because it was in the description here. @gpaumier Also, I noticed this is tagged "not ready to announce" yet - does that not apply to tech bulletin? If so there's still technically time to remove it because even though it ended up in my RSS reader, because publication is not technically until tomorrow. is still time to remove that link. Thank you for the heads-up. I wasn't sure we'd be announcing this in Tech News, because I was confused about the status of this feature, due to last week's rushed deployment. This is why this task was marked as "Not ready to announce" (which does apply to Tech News). On Friday, James added the item to the newsletter, and I edited it to use simpler language; I also added the ISBN bit, based on this task's title. Yes, however we can't make last-minute edits to the newsletter because that only changes the English version; translators need more time to echo the changes. I've removed the Citoid item from this week's issue entirely, and added it to the list of items to announce in next week's newsletter. Krenair mentioned this in rOMWC830c9faa1985: Enable Citoid extension on all VisualEditor wikis.